In mathematics, the Pythagorean theorem or Pythagoras' theorem is a relation in Euclidean geometry among the three sides of a right triangle. The theorem is named after the Greek mathematician Pythagoras, who by tradition is credited with its discovery, although knowledge of the theorem almost certainly predates him. Pythagoras was noted for his obsession with ratios. He believed that ratios could be applied to all aspects of the world. In any right triangle, the area of the square whose side is the hypotenuse (the side of a right triangle opposite the right angle) is equal to the sum of areas of the squares whose sides are the two legs (i.e. the two sides other than the hypotenuse). This equation provides a simple relation among the three sides of a right triangle so that if the lengths of any two sides are known, the length of the third side can be found. A generalization of this theorem is the law of cosines, which allows the computation of the length of the third side of any triangle, given the lengths of two sides and the size of the angle between them. This theorem may have more known proofs than any other. The Pythagorean Proposition, a book published in 1940, contains 370 proofs of Pythagoras' theorem, including one by American President James Garfield. For any three positive numbers a, b, and c such that a² + b² = c², there exists a triangle with sides a, b and c, and every such triangle has a right angle between the sides of lengths a and b. The history of the theorem can be divided into three parts: knowledge of Pythagorean triples, knowledge of the relationship between the sides of a right triangle, and proofs of the theorem. Megalithic monuments from 4000 BC in Egypt, and in the British Isles from circa 2500 BC, incorporate right triangles with integer sides but the builders did not necessarily understand the theorem . Bartel Leendert van der Waerden conjectures that these Pythagorean triples were discovered algebraically . Written between 2000– 1786 BC, the Middle Kingdom Egyptian papyrus Berlin 6619 includes a problem, whose solution is a Pythagorean triple. During the reign of Hammurabi, the Mesopotamian tablet Plimpton 322, written between 1790 and 1750 BC, contains many entries closely related to Pythagorean triples. The Baudhayana Sulba Sutra, written in the 8th century BC in India, contains a list of Pythagorean triples discovered algebraically, a statement of the Pythagorean theorem, and a geometrical proof of the Pythagorean theorem for an isosceles right triangle. The Apastamba Sulba Sutra (circa 600 BC) contains a numerical proof of the general Pythagorean theorem, using an area computation. Van der Waerden believes that "it was certainly based on earlier traditions". According to Albert Bŭrk, this is the original proof of the theorem, and Pythagoras copied it on his visit to India. Many scholars find van der Waerden and Bŭrk's claims unsubstantiated. Pythagoras, whose dates are commonly given as 569– 475 BC, used algebraic methods to construct Pythagorean triples, according to Proklos's commentary on Euclid. Proklos, however, wrote between 410 and 485 AD. According to Sir Thomas L. Heath, there is no attribution of the theorem to Pythagoras for five centuries after Pythagoras lived. However, when authors such as Plutarch and Cicero attributed the theorem to Pythagoras, they did so in a way which suggests that the attribution was widely known and undoubted. Around 400 BC, according to Proklos, Plato gave a method for finding Pythagorean triples that combined algebra and geometry. Circa 300 BC, in Euclid's Elements, the oldest extant axiomatic proof of the theorem is presented. 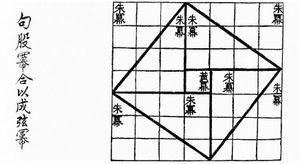 Written sometime between 500 BC and 200 AD, the Chinese text Chou Pei Suan Ching (周髀算经), (The Arithmetical Classic of the Gnomon and the Circular Paths of Heaven) gives a visual proof of the Pythagorean theorem — in China it is called the "Gougu Theorem" (勾股定理) — for the (3, 4, 5) triangle. During the Han Dynasty, from 200 BC to 200 AD, Pythagorean triples appear in The Nine Chapters on the Mathematical Art, together with a mention of right triangles. There is much debate on whether the Pythagorean theorem was discovered once or many times. B.L. van der Waerden asserts a single discovery, by someone in Neolithic Britain, knowledge of which then spread to Mesopotamia circa 2000 BC, and from there to India, China, and Greece by 600 BC. Most scholars disagree however, and favour independent discovery. More recently, Shri Bharati Krishna Tirthaji in his book Vedic Mathematics claimed ancient Indian Hindu Vedic proofs for the Pythagoras Theorem. This theorem may have more known proofs than any other (the law of quadratic reciprocity being also a contender for that distinction); the book Pythagorean Proposition, by Elisha Scott Loomis, contains over 350 proofs. James Garfield, who later became President of the United States, devised an original proof of the Pythagorean theorem in 1876. The external links below provide a sampling of the many proofs of the Pythagorean theorem. Like many of the proofs of the Pythagorean theorem, this one is based on the proportionality of the sides of two similar triangles. In Euclid's Elements, the Pythagorean theorem is proved by an argument along the following lines. Let P, Q, R be the vertices of a right triangle, with a right angle at Q. Drop a perpendicular from Q to the side opposite the hypotenuse in the square on the hypotenuse. That line divides the square on the hypotenuse into two rectangles, each having the same area as one of the two squares on the legs. We see here three similar figures, each being "a square with a triangle on top". Since the large triangle is made of the two smaller trangles, its area is the sum of areas of the two smaller ones. By similarity, it is clear that the same must apply also to the areas of the squares. 1. If two triangles have two sides of the one equal to two sides of the other,each to each, and the angles included by those sides equal,then the triangles are equal in all respects. 2. The area of a triangle is half the area of any parallelogram on the same base and having the same altitude. 3. The area of any square is equal to the product of two of its' sides. 4. The area of any rectangle is equal to the product of two adjacent sides (follows from Lemma 3). Let the perpendicular from on be . Then is parallel to , since both of the angles and are right angles. in any right-angled triangle, the square desribed on the hypotenuse is equal to the sum of the squares described on the other two sides. With the help of trigonometry, this theorem can be extended for all triangles. where and denote the sides of the triangle opposite the angles and ; and cyclic permutations. A visual proof is given by this illustration. The area of each large square is (a + b)². 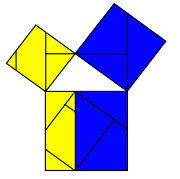 In both, the area of four identical triangles is removed. The remaining areas, a² + b² and c², are equal. Q.E.D. This proof is indeed very simple, but it is not elementary, in the sense that it does not depend solely upon the most basic axioms and theorems of Euclidean geometry. In particular, while it is quite easy to give a formula for area of triangles and squares, it is not as easy to prove that the area of a square is the sum of areas of its pieces. In fact, proving the necessary properties is harder than proving the Pythagorean theorem itself. For this reason, axiomatic introductions to geometry usually employ another proof based on the similarity of triangles (see above). A second graphic illustration of the Pythagorean theorem fits parts of the sides' squares into the hypotenuse's square. A related proof would show that the repositioned parts are identical with the originals and, since the sum of equals are equal, that the corresponding areas are equal. To show that a square is the result one must show that the length of the new sides equals c.
A square created by aligning four right angle triangles and a large square. However, as the large square has sides of length a+b, we can also calculate its area as (a+b)², which expands to a²+2ab+b². This can be shown by considering the angles. One can arrive at the Pythagorean theorem by studying how changes in a side produce a change in the hypotenuse in the following diagram and employing a little calculus. which results from adding a second term for changes in side b. It is doubtful that the Pythagoreans would have been able to do the above proof but they knew how to compute the area of a triangle and were familiar with figurate numbers and the gnomon, a segment added onto a geometrical figure. All of these ideas predate calculus and are an alternative for the integral. The proportional relation between the changes and their sides is at best an approximation, so how can one justify its use? The answer is the approximation gets better for smaller changes since the arc of the circle which cuts off c more closely approaches the tangent to the circle. As for the sides and triangles, no matter how many segments they are divided into the sum of these segments is always the same. The Pythagoreans were trying to understand change and motion and this led them to realize that the number line was infinitely divisible. Could they have discovered the approximation for the changes in the sides? One only has to observe that the motion of the shadow of a sundial produces the hypotenuses of the triangles to derive the figure shown. For a proof by the methods of rational trigonometry, see Pythagoras' theorem proof (rational trigonometry). 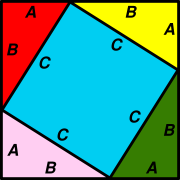 Let ABC be a triangle with side lengths a, b, and c, with a2 + b2 = c2. We need to prove that the angle between the a and b sides is a right angle. We construct another triangle with a right angle between sides of lengths a and b. By the Pythagorean theorem, it follows that the hypotenuse of this triangle also has length c. Since both triangles have the same side lengths a, b and c, they are congruent, and so they must have the same angles. Therefore, the angle between the side of lengths a and b in our original triangle is a right angle. A Pythagorean triple consists of three positive integers a, b, and c, such that a2 + b2 = c2. In other words, a Pythagorean triple represents the lengths of the sides of a right triangle where all three sides have integer lengths. Evidence from megalithic monuments on the British Isles shows that such triples were known before the discovery of writing. Such a triple is commonly written (a, b, c), and a well-known example is (3, 4, 5). A Pythagorean triple is primitive if a, b, and c have no common divisor other than 1. There are infinitely many primitive triples, and all Pythagorean triples can be explicitly generated using the following formula: choose two integers m and n with m > n, and let a = m2 − n2, b = 2mn, c = m2 + n2. Then we have a2 + b2 = c2. Also, any multiple of a Pythagorean triple is again a Pythagorean triple. 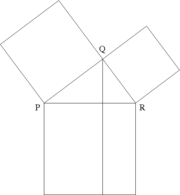 Pythagorean triples allow the construction of right angles. The fact that the lengths of the sides are integers means that, for example, tying knots at equal intervals along a string allows the string to be stretched into a triangle with sides of length three, four, and five, in which case the largest angle will be a right angle. This methods was used to step masts at sea and by the Egyptians in construction work. A generalization of the concept of Pythagorean triples is a triple of positive integers a, b, and c, such that an + bn = cn, for some n strictly greater than 2. Pierre de Fermat in 1637 claimed that no such triple exists, a claim that came to be known as Fermat's last theorem. The first proof was given by Andrew Wiles in 1994. One of the consequences of the Pythagorean theorem is that irrational numbers, such as the square root of two, can be constructed. A right triangle with legs both equal to one unit has hypotenuse length square root of two. The Pythagoreans proved that the square root of two is irrational, and this proof has come down to us even though it flew in the face of their cherished belief that everything was rational. According to the legend, Hippasus, who first proved the irrationality of the square root of two, was drowned at sea as a consequence. When θ is 90 degrees, then cos(θ) = 0, so the formula reduces to the usual Pythagorean theorem. In particular, ||v + w||2 = ||v||2 + ||w||2 if and only if v and w are orthogonal. The generalisation of this result to infinite-dimensional real inner product spaces is known as Parseval's identity. When the theorem above about vectors is rewritten in terms of solid geometry, it becomes the following theorem. If lines AB and BC form a right angle at B, and lines BC and CD form a right angle at C, and if CD is perpendicular to the plane containing lines AB and BC, then the sum of the squares of the lengths of AB, BC, and CD is equal to the square of AD. The proof is trivial. Another generalization of the Pythagorean theorem to three dimensions is de Gua's theorem, named for Jean Paul de Gua de Malves: If a tetrahedron has a right angle corner (a corner like a cube), then the square of the area of the face opposite the right angle corner is the sum of the squares of the areas of the other three faces. There are also analogs of these theorems in dimensions four and higher. In a triangle with three acute angles, α + β > γ holds. Therefore, a2 + b2 > c2 holds. In a triangle with an obtuse angle, α + β < γ holds. Therefore, a2 + b2 < c2 holds. where α is the angle opposite to side a, β is the angle opposite to side b and γ is the angle opposite to side c.
The Pythagorean theorem is derived from the axioms of Euclidean geometry, and in fact, the Euclidean form of the Pythagorean theorem given above does not hold in non-Euclidean geometry. (It has been shown in fact to be equivalent to Euclid's Parallel (Fifth) Postulate.) For example, in spherical geometry, all three sides of the right triangle bounding an octant of the unit sphere have length equal to π / 2; this violates the Euclidean Pythagorean theorem because . By using the Maclaurin series for the cosine function, it can be shown that as the radius R approaches infinity, the spherical form of the Pythagorean theorem approaches the Euclidean form. where cosh is the hyperbolic cosine. By using the Maclaurin series for this function, it can be shown that as a hyperbolic triangle becomes very small (i.e., as a, b, and c all approach zero), the hyperbolic form of the Pythagorean theorem approaches the Euclidean form.